Martins Licis was crowned the Ultimate Strongman World Champion by defeating 11 of the strongest men on the planet. 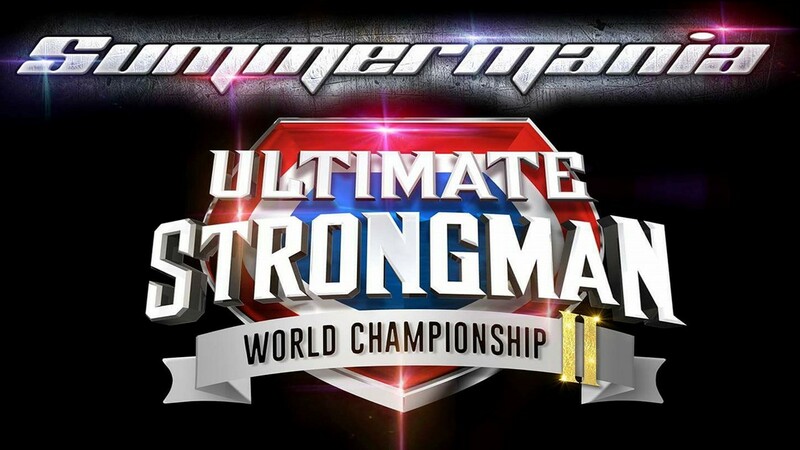 This event was hugely supported by strongman fans from all over the UK. The weather was a scorching 30 degrees which made it very difficult for all competitors. However, this made the crowd cheer more and helped the competitors to perform to their best. The crowd were excited to see the head referee Geoff Capes who greeted them with his famous Badger dance. 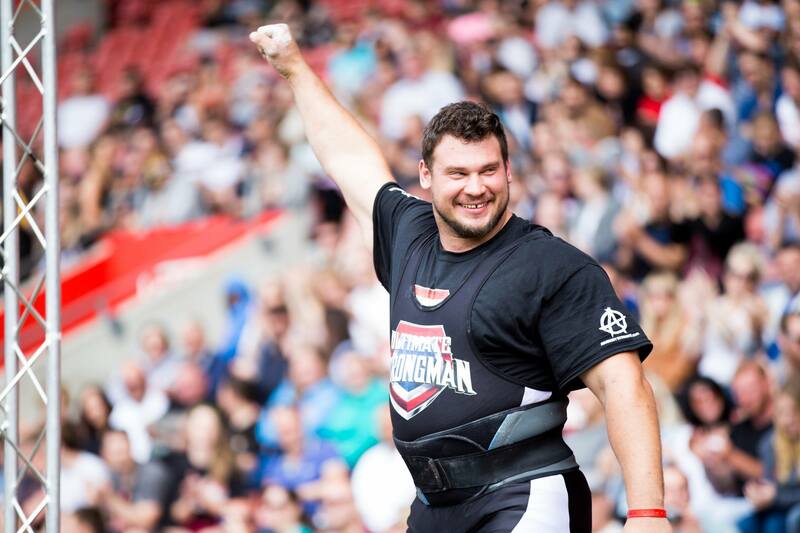 The biggest cheer of the day went to the special appearance of the greatest strongman of all time, Zydrunas Savickas. 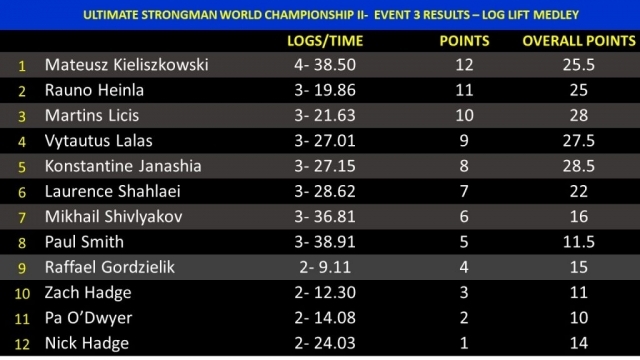 Unfortunately, Zydrunas was carrying several injuries and had to withdraw from the competition but wanted to appear as a guest for the crowd. To kick off our World Championship was event 1, The Farmers Walk, with a 150KG gas bottle in each hand. This was a blood and guts event with the skin ripping off the hands of each competitor. 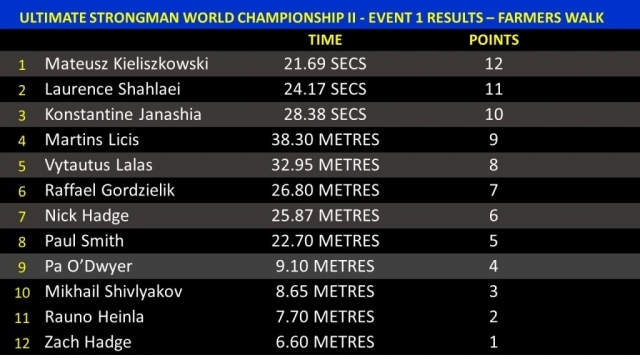 Superb performances by the fan favourites, Nick Hadge, Zach Hadge and Raffael Gordzielik but there were only 3 men that completed the 40m course including Konstantine Janashia and the current World Champion, Laurence Shahlaei but it was Mateusz Kieliszkowski of Poland who completed the 40 metre course in a winning time of 21.69 secs. During the interval the crowd were entertained with the Daddy Gun. This gun shot out t-shirts to different sections of the crowd and created huge competition! Event 2 was the Silver Dollar Deadlift. 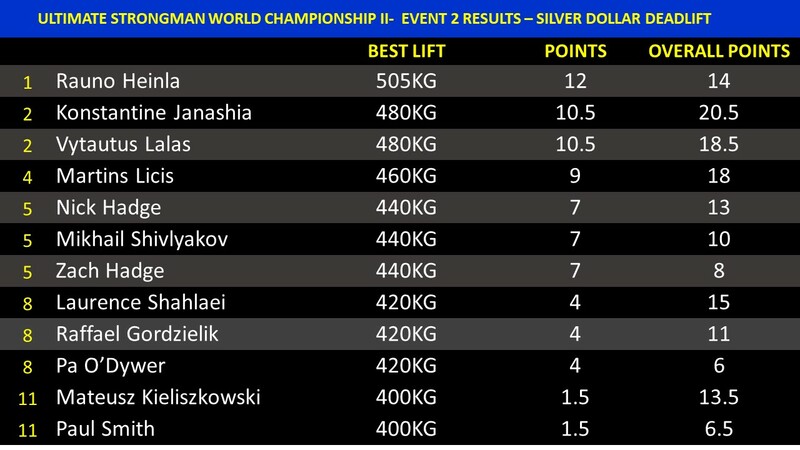 All competitors made light work of the 400KG opening weight but as the weight started to increase the competitors were dropping like flies, including the current leader Mateusz Kieliszkowski who struggled to lift 420KG which cost him valuable points. Mikhail Shivlyakov had a torn calf and battled through to lift 440KG! In the end it came down to 3 men, Konstantine Janashia, Vytautus Lalas and Rauno Heinla. The 3 men were chasing the current world record of 500KG set by Ken Brown of the USA. The competitors decided to attempt a new world record of 505KG! Janashia and Lalas got the weight off the floor but couldn’t get it past their knees. However, it was Rauno Heinla of Estonia who made the 505KG look like the opening weight. A tremendous show of strength. World Records was at the centre of our World Championship with Mateusz Kieliszkowski of Poland smashing the previous dumbbell World Record of 143KG set by Dimintar Savitmov of Bulgaria last year by pressing the milestone 150KG dumbbell above his head with one hand. Event 3 was the Log Lift Medley. Competitors had a series of steel logs to press from 120KG-200KG. All the competitors made the 120KG and 140KG look easy but the 160KG was more difficult and was pressed by most competitors. 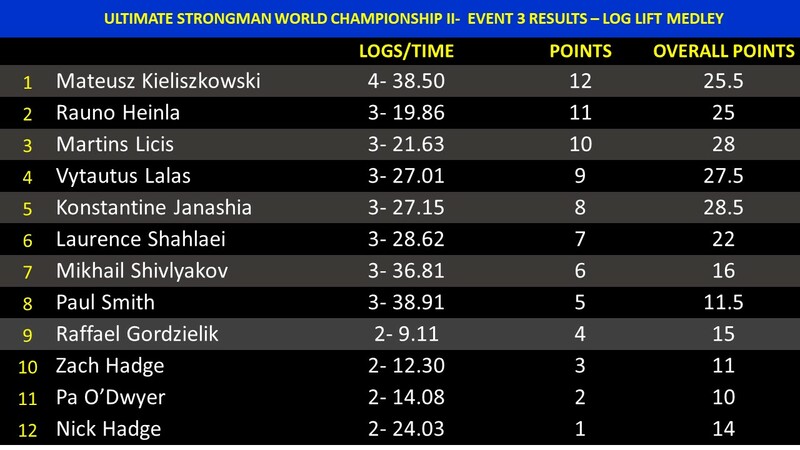 However, the 180KG was too much for these men but it was Mateusz Kieliszkowski who showed again his explosive pressing strength to win this event by pressing the 180KG log in 38.50 secs. 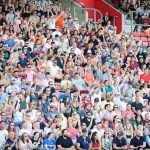 The crowd were then entertained with a YMCA dance co-ordinated by the Gladiator James Crossley and everyone was on their feet joining in! The fourth event was the Strongman Flag Hoist. 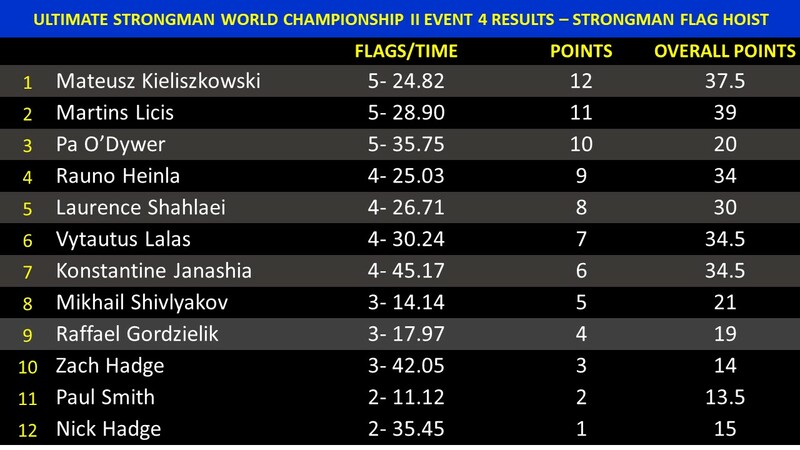 This was a new event for most of the competitors and only 3 men managed to finish the discipline including Pa O’Dwyer of Ireland, Martins Licis of Lativa but it was Mateusz Kieliszkowski again who dominated the disicipline by hoisting all 5 flags in a winning time of 28.90 secs. 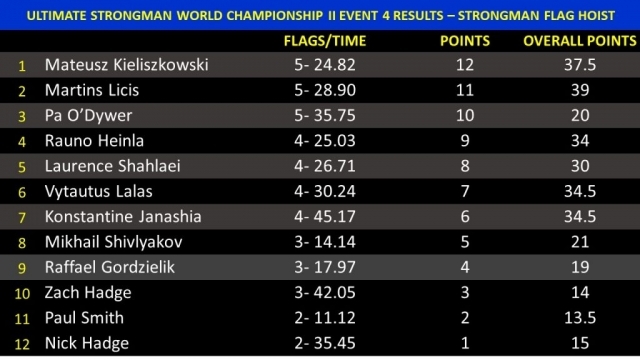 Again, Martins Licis was showing his consistency in each event. The final event was the Stones of Strength with 1 ½ points splitting the leaders, Martins Licis and Mateusz Kieliszkowski. This was a repeat of the first Summermania with the title being decided on the stones. 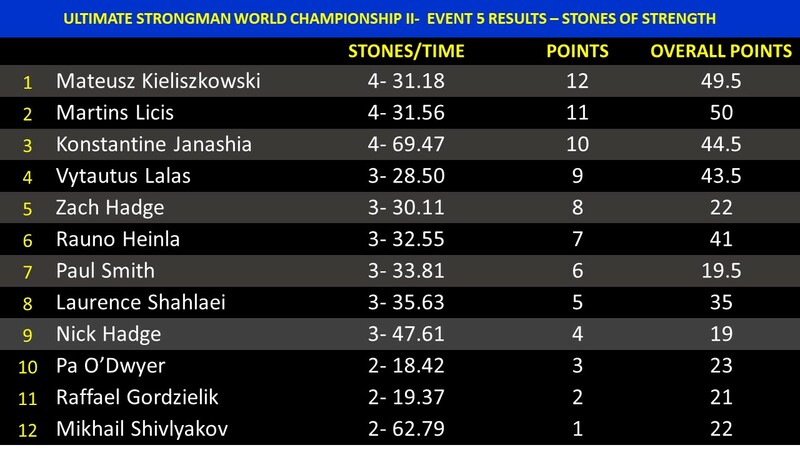 Both competitors flew with the first 3 stones, but it was Mateusz Kieliszkowski who managed to lift the 4th stone onto the Causeway wall first. 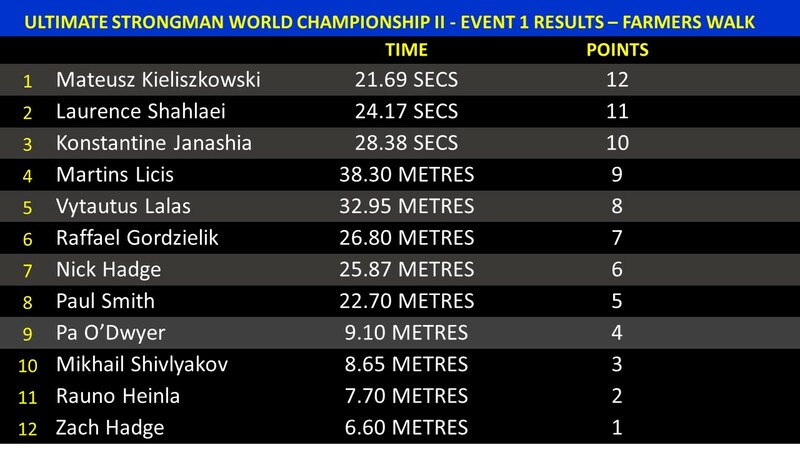 However, Mateusz Kieliszkowski did enough to win the event with 4 stones in 31.18 secs but Martins Licis managed 2nd place with 4 stones in 31.56 secs. 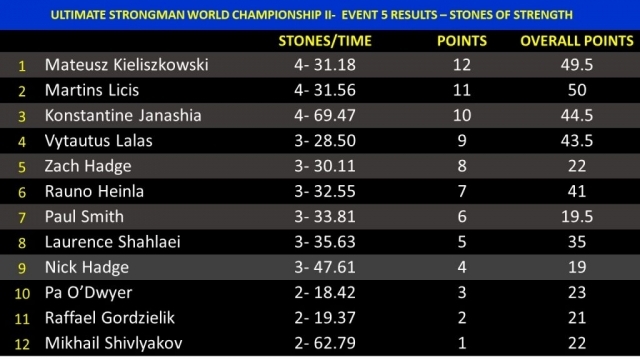 This was a huge result for Martins as 3rd in the event was Konstantine Janashia of Georgia with 4 stones in 69.47secs. This meant Martins Licis gained enough points in the stones to win the tile by 1/2 a point. 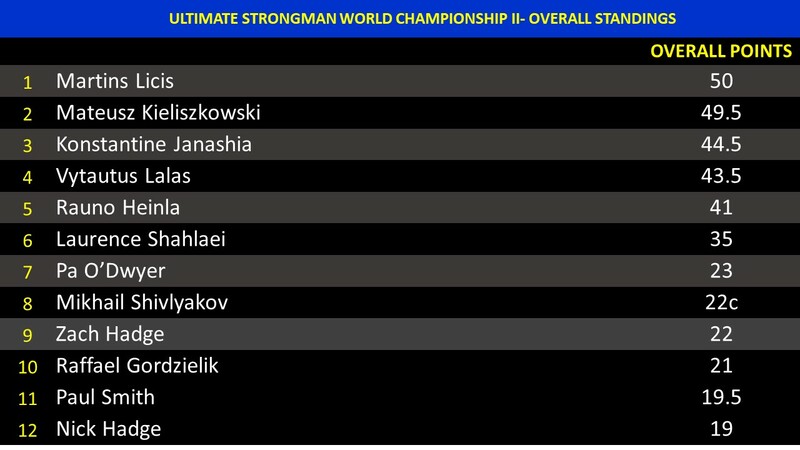 Again, the Stones of Strength decided the title with Martins Licis becoming the Ultimate Strongman World Champion and lifting the belt by ½ a point. Mateusz Kieliszkowski’s deadlift cost him valuable points so he settled for second and Konstantine Janashia won the battle to take the 3rd place on the podium. Laurence Shahlaei put up a massive fight for the title but had to settle for 6th overall in a strong line up. 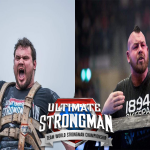 If you want to go to our next Ultimate Strongman event, the Master World Championship, book your tickets at www.ultimatestrongman.tv. Come see Zydrunas Savickas defend his title against the likes of Vidas Blekaitis, Tarmo Mitt, Ervin Katona and Mark Felix.